You hear those stories of crazy soccer parents who go bonkers when the kids’ competition gets to them. Parents forget that sports should be a fun, active experience for the kids—not to mention a good learning experience. Competition is good, of course, but not cutthroat competition when your kids haven’t even learned to tie their shoes! 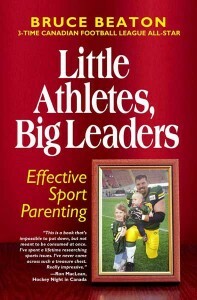 Bruce Beaton’s book, Little Athletes, Big Leaders: Effective Sport Parenting, helps parents learn how to set a good example for their kids so that they can be good athletes and good people. If your kids are in sports, read on to find out how you can be the best sports parent you can be! What are the biggest mistakes parents make when it comes to supporting their kids from the sidelines? Generally, the biggest mistake parents make is that they forget how hard it is to do what the kids are doing. Why is it so important to avoid the negativity when it comes to sports? Negativity erodes relationships. John Gottman et al have done wonderful work in this regard at the University of Washington, check him out on YouTube if you have a minute. The “magic ratio” for youth in sport is about five positives to one negative if you want to ignite a long-term passion in the sport AND reinforce and develop a loving, nurturing long-term relationship with your child (pay attention to this, Dad!). People’s No. 1 need is to be appreciated (Carl Jung), and if you search for behaviors to reinforce, you will be much more effective when you do need to change an inappropriate behavior. How can parents encourage their kids to get involved in sports? Make it fun. Market it to your kids as fun time together…and then make it fun time together. Get them there on time, pay attention to what they are doing, enjoy a little fun time together on the way there or on the way back. The best sport parents and early development coaches never underestimate the FUN factor in sport during the ignition phase (Daniel Coyle—The Talent Code), which is generally the first four or five years in a sport. You’ll never regret making it fun so that your child falls in love with the experience and thus learns all that sport can teach them in the coming years. Why is sports participation so important for kids? What lessons translate from the field to life? The biggest lessons are collective and individual goal setting (and the relationship between the two). Kids need to learn about the transferrable skill called goal setting, which is big goals and daily steps. The second is the myriad of teachable moments your child will be exposed to in sport, and in those moments you’ll get to teach them about how to respond to setbacks, the illusion of pressure and issues that arise that are out of their control. It’s an experiential school, different from the rows and rules of the other school they go to. The third thing is they will develop interpersonal skills, which are the No. 1 predictor of leadership effectiveness as an adult.